Tickets are now on sale for the famous, annual Haddo House Choral & Operatic Society Carol Concerts at Haddo House. The concerts are celebrating 70 consecutive years of carol performances in the historic chapel and tickets always sell out very quickly. June Gordon (then Lady Aberdeen) and her husband David the 4th Marquess of Aberdeen and Temair held the first carol concert in 1945, just as the clouds of the Second World War were receding. At this time carols were fairly unheard of in the NE of Scotland so the workers on the estate who attended must have heard the delights of Hark the Herald and other famous carols for the very first time – one can only imagine the impact! Since then not a year has been missed and the Choral Society fills the rafters with unbelievably beautiful music annually. These concerts will include carols form the earliest performances, such as The Holly and the Ivy which was performed in 1945 with founder member Louisa Innes singing a line aged 12; HHCOS are delighted to report Louisa will attend this year to reprise her solo. Christmas starts for so many people with the HHCOS carol concerts – including the chorus members themselves. They always give their best and this year will be no exception with a beautiful and inspiring programme of pieces. 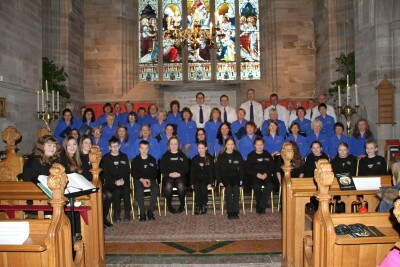 The concerts are on Sunday 13th and Saturday 19th December with two performances each day at 2.00pm and 4.00pm. Tickets are £16 to include refreshments in the library and a souvenir programme. They can be purchased online at hhcos.org.uk/boxoffice, or call 01651 851111 between 7.00pm and 9.00pm Monday – Thursday.